A landmark for fine dining and entertainment since its opening, Malconi’s is the place to be in the city of Athens. Since 2011, Malconi's has been at the forefront of the local scene setting the trends of contemporary Mediterranean gastronomy. From its unbeatable cuisine to its imaginative cocktails and extensive wine list, this star-studded-crowd gastropub with friendly stuff, jams music from noon till late at night. The restaurant that brought Sunday's brunch to the city still serves the most intriguing catalog be it for lunch, dinner, Sunday's brunch or anything in between. Located at the heart of the posh Kolonaki neighborhood in downtown Athens, Malconi's is the meeting point not only of the Athenian elite but also of the local and international sophisticated crowd, as it exemplifies the easy glamour and charm of the area with its cozy and hip atmosphere. A hotspot, a meeting place for a fun day or night out. To really get to know a city, living in it is not enough. You have to walk its streets and unlock its secrets. The downtown is the place that captures the soul of the city and the essence of its roaring street life and relaxed lifestyle. Located on the slopes of Lycabettus Hill, Kolonaki is one of the most elite neighbourhoods of downtown Athens. Here, the city's cultural and social life are alive from early morning till late at night. Kolonaki is the place to see and be seen! Malconi's is situated at the heart of Kolonaki where it exhibits its high standarts of taste, professional level of service and warm hospitality in an impressive environment. We are ready to rock all your sences! Fine dining and Entertainment hand in hand. It was the summer of 2015 right at the heart of the posh Kolonaki neighborhood that magicians, clowns, stilt dancers and drones where all giving an unprecedented show at the Malconi's Instagram Party. Hip crowds with hundreds of Malconi's funs joined this out of this world night which was marked as a cornerstone for the Athenian gastronomic entertainment. The culture and philosophy of Malconi's is that fine dining and joyful entertainment should not be distinct from each other. They are factors that when properly combined, they create circumstances that elevate our state of mind, recharge our batteries and prepare us for the next day's battles. Fine dining is not synonymous to secluded, uneventful environments... at least not in Malconi's! Chef Giannis Kosmadakis graduated from "Le Monde Chef School" with a degree in culinary cut. During his studies he worked as an intern in various restaurants in Athens such as "Piazza Mela" and "Mayor" and practiced his techniques in "La Bischa" restaurant in Milan. He worked for four years as Head Chef at the Italian restaurant "Altro" in Kolonaki and since November 2011 he is the Head Chef of Malconi's. 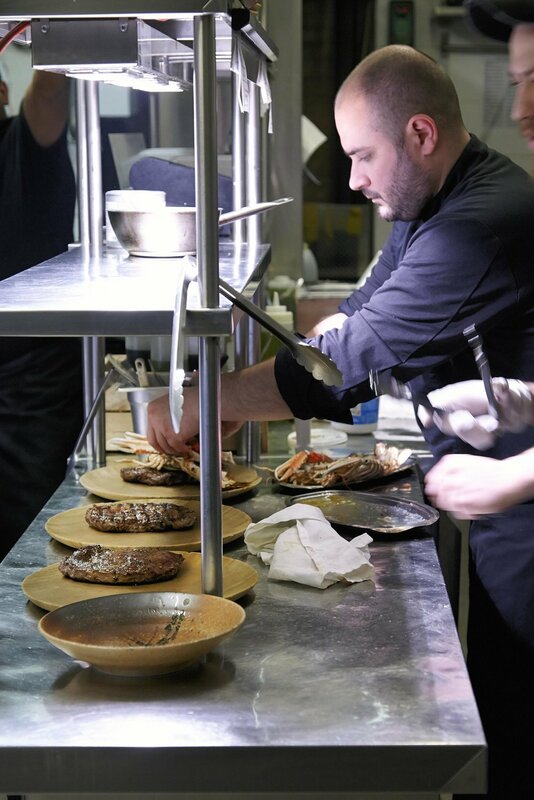 He has received numerous praises from various media and has been characterized as a creative and promising Chef that combines ingenuity with technique, always with respect to the Mediterranean cuisine and an emphasis to the natural taste and quality of the ingredients.